The time to start planning your next group outing or special event in Fernie is right now before all of the town’s conference facilities and guest rooms are fully booked. Red Tree Lodge is one of the only Fernie hotels to provide group-friendly amenities for weddings, family reunions, sports teams, and beyond. Not only do we offer up to 20 percent off group stays, but you’ll also be able to take advantage of our guest kitchen, meeting spaces, free laundry facilities, and so much more! Keep reading to learn more about our first-class amenities, facilities, and service. 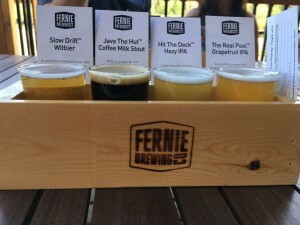 Regardless of the season, you’ll always be steps away from exhilarating adventures, genuinely stunning beauty, eclectic shopping, and a refreshing pint of craft beer at Fernie Brewing Company. Fernie is known for its legendary powder, world-class mountain biking, spectacular events, and a seemingly endless array of outdoor adventure, including fat biking, golfing, and whitewater rafting. Visit our travel blog for even more inspiration. After each memorable day in the Canadian Rockies, retreat to Red Tree Lodge, one of the only group-friendly Fernie hotels. Indulge in a hickory-smoked braised brisket sandwich at Smokehouse, soak in the on-site hot tub, and enjoy the best sleep of your life inside an ultra-comfortable guest room. Call us today at 1-250-423-4622 to book your next group getaway into the Canadian Rockies! 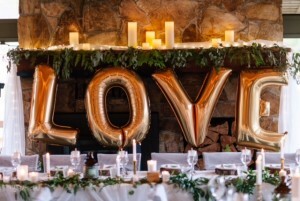 There’s no better time than right now to start planning a dream wedding in the scenic town of Fernie, BC. Our gorgeous city sits at the foothills of snow-covered Canadian Rockies and is surrounded by lush forestry and the tranquil Elk River. There are countless ceremony possibilities in our serene wilderness. Fernie also has world-class photographers and event planners who are only a phone call away. Planning weddings in British Columbia is much easier when you choose a stay at Red Tree Lodge. Here’s a quick rundown of what the breathtaking community of Fernie has to offer eager brides and grooms. As mentioned earlier, there are several popular ceremony locales scattered throughout the city and the surrounding natural wilderness. Recite your heartfelt vows high in the cloudy Rockies outside of Lost Boys Cafe. Say “I do” at Annex Park near a babbling creek with the towering Rocky Mountains in the background. Annex Park is only a five-minute walk from Red Tree Lodge! Mount Fernie Provincial Park, Fernie Golf Club, and “I Dew Point” at Island Lake are also popular choices. Remember to pair your unforgettable wedding with world-class photography from Raven Eye! Red Tree Lodge proudly provides wedding receptions inside Smokehouse Restaurant, our on-site dining room which seats up to 85 people. Silver Lining Events is our preferred wedding planning service – these talented folks do incredible work, and they’re incredibly flexible! Please call Jody for wedding menu possibilities at 1-800-977-2977. 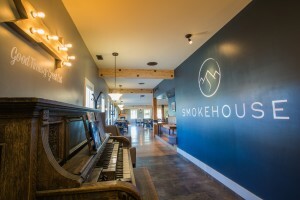 Smokehouse has two fireplaces, three interconnecting sitting areas, and a full bar. 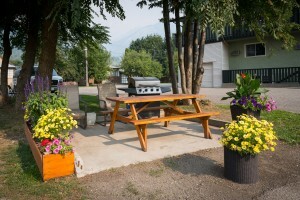 Red Tree Lodge is one of the only Fernie hotels that provides an on-site reception space. 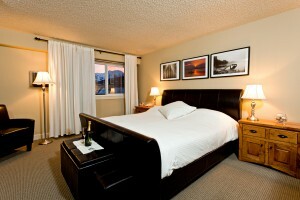 All weddings in British Columbia should end with a memorable night with your sweetheart inside a lavish bridal suite. Red Tree Lodge’s Mount Fernie Suite features a soothing jetted tub fit for two, an ultra-comfortable king-size bed, a separate living area, and stunning mountain vistas. To inquire about wedding blocks, please dial 1-250-423-4622. 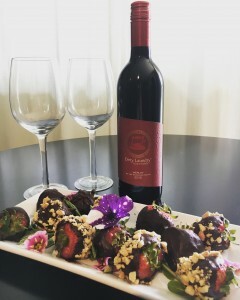 Planning weddings in British Columbia is especially enjoyable because there is an endless array of springtime activities for newlyweds in the Fernie area. Start your honeymoon with spa treatments at Spa 901, a “Java the Hut” coffee milk stout at Fernie Brewing Company, and some Kootenays exploration via canoe, mountain bikes, or an old-fashioned hike. For even more inspiration, visit our travel blog! It’s never too early to start planning your next romantic getaway to Fernie, a beautiful tourist town in the midst of an awe-inspiring Southeastern British Columbia mountain range. Fernie is widely known for its premier alpine skiing, mountain biking, and whitewater rafting, but we’re quickly becoming a desired romantic escape for adventurous couples. Romantic getaways in British Columbia are equally exciting, relaxing, and invigorating thanks to our wide array of activities near charming Red Tree Lodge. There are dozens of things to do in Fernie, BC, for couples young and old, especially in the springtime. When there isn’t snow on the ground, Red Tree Lodge is a popular mountain biking hub. We have an on-site bike washing station, bike-tuning stands, storage space, and so much more! Rent one of our complimentary cruiser bikes and explore Fernie, BC. Enjoy a hazy IPA at Fernie Brewing Company, a craft cocktail at Fernie Distillers, or an elaborate ice cream treat at Happy Cow. After a lovely stroll through downtown Fernie, play 18 holes at Fernie Golf Club, which is surrounded by stunning snow-capped mountains. All romantic getaways in British Columbia should also include a relaxing day indoors. When you’re not lounging in our lavish Mount Fernie Suite here at one of the premier Fernie hotels, you can take full advantage of our many on-site amenities. 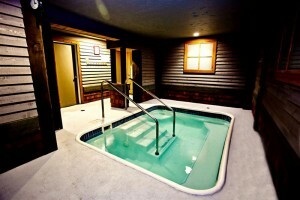 We have a soothing indoor hot tub, a rejuvenating swimming pool, and a calming sauna. One of the most unique on-site features here at Red Tree Lodge is our theater room, complete with several romantic films. We have many classic romances such as Titanic, Dirty Dancing, and Notting Hill. Retreat to the luxurious Mount Fernie Suite after a lovely meal at Smokehouse Restaurant. Share a bottle of award-winning vino inside your large modern jet tub, watch the sunset on your 28-foot balcony, and enjoy a peaceful slumber in your ultra-comfortable king-size bed. Please give us a call at 1-250-423-4622 to book a well-deserved romantic getaway to beautiful Fernie, BC.